This year has been quite a ride for pop-singer Adele. She cancelled tour dates due to a polyp on her vocal cords that required laser surgery and she chose to take some time off to focus on her relationship with new beau Simon Konecki. Just as the world started hearing reports of a healing Adele who would definitely plan a huge world tour if her heart decided on it – the fans were taken aback by another shocker. Adele, after just one year of dating Konecki, was going to be a mother. The Adele pregnancy rumors were verified by the star personally and she claims she couldn’t be happier with the way 2012 is shaping up. Adele has not been afraid of talking about how one particular past relationship helped shape her latest album. The chart rocking album ‘21’ has beaten just about every record and it’s won her a ton of awards; but if music is an expression of the soul she’ll have a lot to say after this year. Some fans thought the star’s career was over and done with after she cancelled tour dates for vocal cord surgery. A polyp on the vocal cord has hemorrhaged and she needed to have laser surgery immediately. The surgery went well and the star self-admittedly found the hardest part of recovery being her inability to find a cell phone application that allowed her to curse when talking. She stopped smoking and lost quite a bit of weight. With a new relationship and a new outlook on life, the next announcement was that she was taking time off to relax and get closer to her boyfriend Simon Konecki. 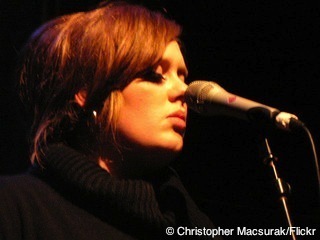 Soon after that announcement Adele was pregnant and preparing for life as a new mum. Despite the jokes about finally being able to eat Shepherd’s Pie, the star is truly happy with the idea of having a baby. She is even working on staying active during the pregnancy by taking line dancing lessons after falling in love with country music working in Tennessee. While she’s always been upfront and open with her fans, the Adele pregnancy announcement did not come with a due date. Some reports say she’s due in September, but others put the date a little later in the year. The last time Adele was seen in public flaunting in front of photographers was February, 2012. She would have been two months along at that time. Since then, she’s kept out of the lime light and managed to stay away from paparazzi. We’ll see what happens in the next few months.